Natural products have been used by humans for thousands of years for the treatment of different medical conditions. Opium, one of the oldest herbal medicines used by humans, is the dried latex obtained from the opium poppy (Papaver somniferum). As an herbal medicine, opium is used as a sedative and for the treatment of diarrhea. Opium contains more than 20 alkaloids, the pentacyclic compounds morphine, codeine and thebaine being the main psychoactive alkaloids. The opioid morphine was first isolated in 1803 but it wasn’t until 1833 when morphine was isolated and purified on a commercial scale. Morphine, which is poorly absorbed in oral dosage forms due to an extensive first pass metabolism, was found to be a potent analgesic and sedative when administered intravenously later on in the 19th century (more so than opium!). However, serious side effects such as respiratory depression, constipation and addiction became known and became of concern. Despite the known side effects, morphine is still one of the most effective drugs for alleviating pain. The discovery and development of safe, potent, non-addictive opioids that can be administered orally remains one of the main objectives of the field of opioid pharmacology and medicinal chemistry to this day. Opiate: in pharmacology, opiate is the term classically used to mean a drug derived from opium. Opioid: the term used to designate all substances, including natural, semisynthetic and synthetic, that interact (including antagonism) with opioid receptors, which are a group of inhibitory G protein-coupled receptors (GPCRs) with opioids as ligands. Analgesics: Colloquially known as painkillers, analgesics are any member of the group of drugs used to achieve analgesia (relief from pain). Sometimes referred to as the “morphine skeleton”, morphinan is the prototype chemical structure of a large chemical class of psychoactive drugs, which include opioid analgesics (see below). 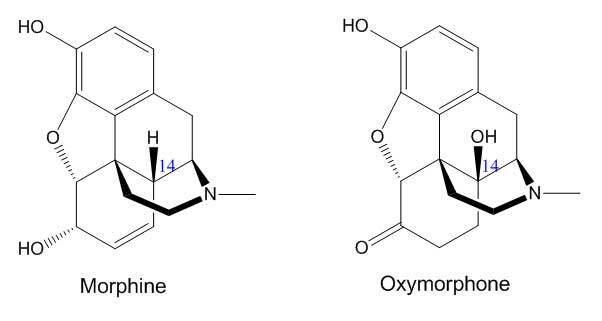 Morphine is an example of a naturally-occuring opioid analgesic of the morphinan-type. 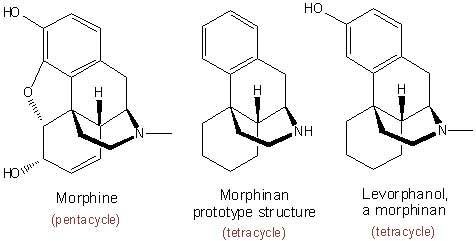 Morphinan is also the term used for tetracyclic morphine derivatives such as levorphanol that lack the ethereal oxygen bridge. 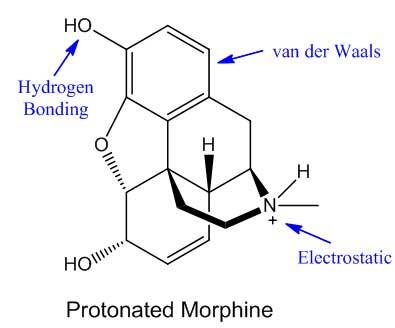 In the central nervous system (CNS), the main drug targets of the morphine molecule are the µ, κ and δ opioid receptors, also referred to as the MOR, KOR and DOR, respectively. Morphine acts as an agonist for all three and as mentioned earlier, all three aforementioned receptors are GPCRs. Morphine, and many other structurally similar opioids, interact more strongly with the µ receptors in general. 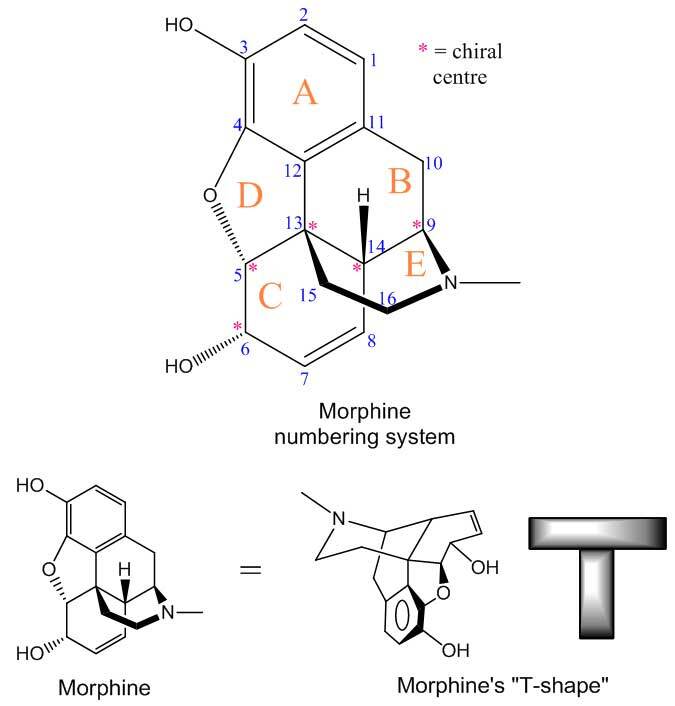 Morphine contains five rings (A – E) and is T-shaped. Since morphine has five rings, it is said to be pentacyclic. As it contains a tertiary amine, morphine therefore has a basic group (pKa ~8-9). The molecule also has alcohol, ether, alkene and phenol moieties and five asymmetric centers. 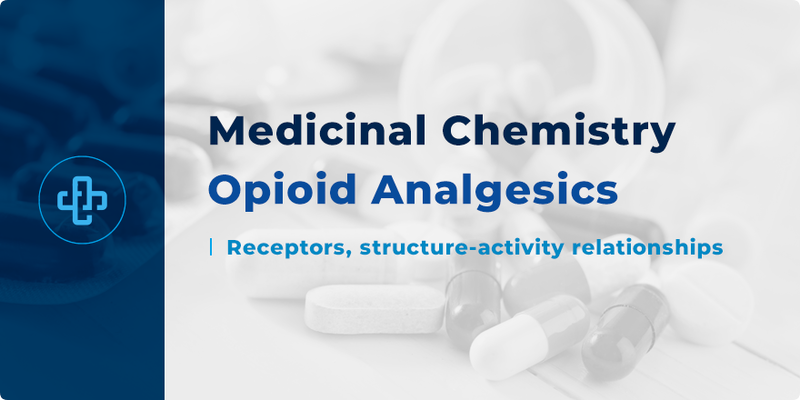 Through the synthesis and/or analysis of several morphine derivatives, several functional groups have been identified as crucial to the molecule’s activity and certain molecular modifications can result in different effects. Key intermolecular interactions with the drug target have also been identified. The phenolic –OH at position 3 is thought to interact with the binding site via hydrogen bonding. Removal has been observed to reduce activity. Note: there are cases where the phenolic –OH is masked as another functional group (i.e. prodrugs such as diamorphine) which enhance hydrophobicity and hence improve the ability to cross the blood-brain barrier (BBB), ultimately leading to enhanced analgesia. 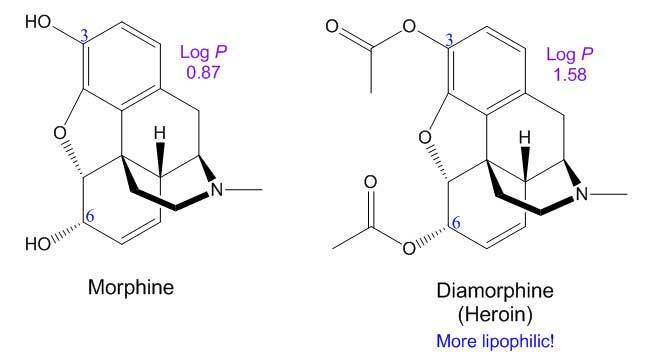 In the case of diamorphine, both the phenolic hydroxyl and the hydroxyl in position 6 have been acetylated. 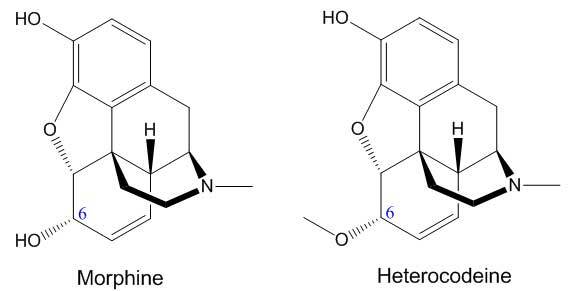 Through the activity of metabolic enzymes, both the phenolic –OH and position 6 hydroxyl groups are unmasked by esterase enzymes in the CNS, converting diamorphine to morphine. The aromatic ring is thought to interact via van der Waals forces at the binding site. Conversion to a methyl ether (e.g. heterocodeine) enhances activity (x6 enhancement). The methyl ether at position 6, which confers an increase in lipophilicity, can undergo metabolic O-demethylation to yield a hydroxyl functionality. The protonated form of the tertiary amine is thought to interact via electrostatic interactions at the binding site. Replacing the methyl group with a phenethyl group results in enhanced activity (~14x of morphine, e.g. N-Phenethylnormorphine). The phenyl group of N-Phenethylnormorphine is thought to interact via van der waals interactions with an extra binding region. Replacing the methyl group with allylic group or cyclopropylmethyl group results in antagonistic activity. (e.g. Naloxone, Nalorphine, Naltrexone and Nalmefine). 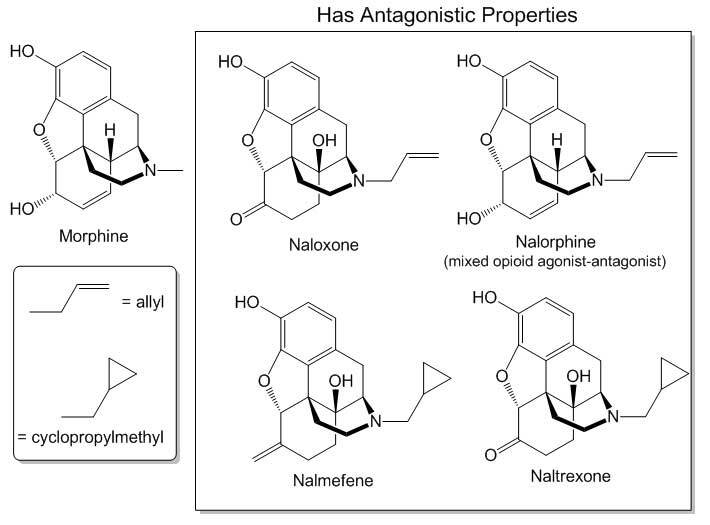 Nalorphineis actually a mixed opioid agonist–antagonist with opioid antagonist and analgesic properties. Stereomutation of even one asymmetric center can result in a significant geometric change of the molecule. For instance, a change in stereochemistry at position 14 results in a significant reduction in potency. Replacing the hydrogen at position 14 with a hydroxyl can result in an increase of activity (x2.5 in the case of oxymorphone). This suggests that there is a possible additional hydrogen bonding interaction at the binding site and that the introduction of a moiety that can readily establish hydrogen bonds at position 14 can result in enhanced activity. Removal of morphine’s ethereal oxygen (i.e. no Ring D), as mentioned earlier, gives the tetracyclic morphine derivatives known as the morphinans, which retain analgesic properties. This indicates that the ethereal oxygen is non-essential. Since morphinans are structurally simpler, chemical synthesis is relatively easier. 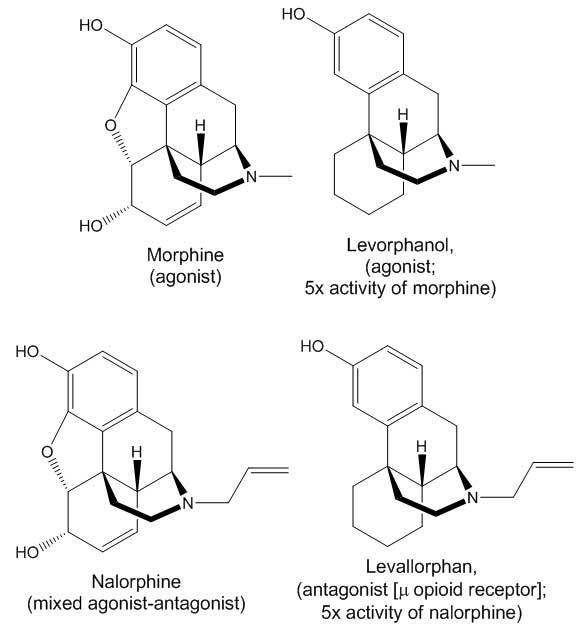 Notable examples of morphinans include levorphanol (agonist, 5x activity of morphine) and levallorphan (antagonist, 5x activity of nalorphine). Levallorphan’s amine group, like nalorphine and naloxone, is allyl-substituted. Morphinans are generally more potent than the pentacyclic morphine counterparts. Dependence, as a side effect, remains an issue. The absence of Ring E results in a loss of activity. (1) Stein, C. Opioid Receptors. Annu. Rev. Med.2016, 67 (1), 433–451 DOI: 10.1146/annurev-med-062613-093100. (2) Patrick, G. L. An Introduction to Medicinal Chemistry; 2013. (3) Woolf, C. J. Overcoming Obstacles to Developing New Analgesics. Nat. Med. 2010, 16 (11), 1241–1247 DOI: 10.1038/nm.2230.